Five Points MARTA Station,(plaza level). 5:30 p.m. Top Five Teams announced! On Hunt Day you will receive a Hunt Booklet and be asked to look for things items and places around MARTA's rail system. MARTA’s rail map and schedule will be in your Hunt Booklet. There’s a limited number of teams that can participate. Teams will sign up on a first come, first served bases and must have a complete group of four participants to be able to participate in the Scavenger Hunt. Creating a team lead will not guarantee you a spot unless the entire team is registered in time. In order to participate in the Hunt you must register prior to the event online and check-in at your designated table between 10:30 a.m. – 11:45 am located at Five Points MARTA Station. If you do not check-in during this time you cannot win a prize. Teams may split up, but must use MARTA rail. Teams sharing Hunt information or answers with other teams or utilizing unregistered adults will be disqualified. MARTA reserves the right to disqualify participants at our discretion. At the end of the Hunt a team representative must turn in the original Hunt booklet at the check-out table by 4 p.m. ET sharp (the entire team does not need to be present). Only a team representative in line on or before 4 p.m. will be allowed to submit their Hunt booklet. Winners will be announced at 5:30 p.m.You do not need to be present to win. However, in the event of a tie, one representative from each team will be asked tie-breaking questions. The team that answers the most tie-breaking questions correctly will be the winner. 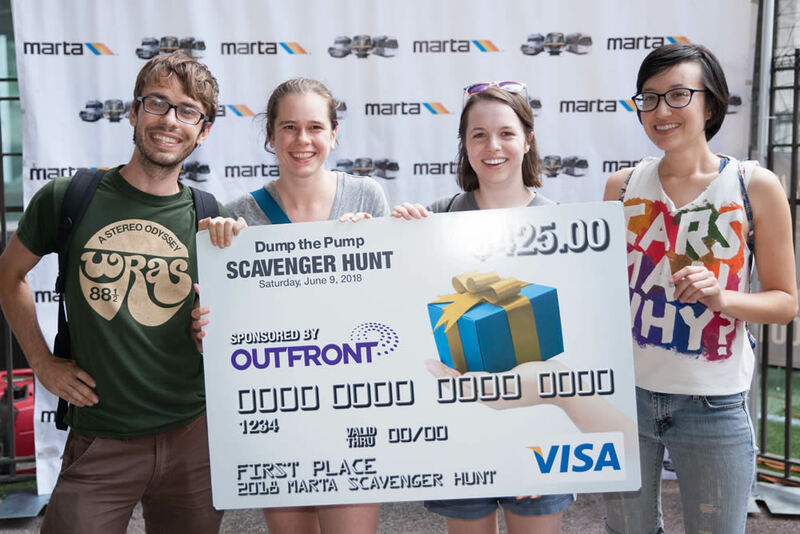 Winning team names will be posted on the @MARTASERVICE Twitter account using #DumpThePump as well as MARTA’s website www.itsmarta.com. VISA Gift Cards will be available to the Top 5 Teams by prior arrangement, beginning Tuesday, June 12, 2018. Use #dumpthepump or #itsmarta and go to Instagram or Twitter to share your Scavenger Hunt pictures. All Red/Gold trains will run on a normal 20-minute weekend schedule. Rail service between Lindbergh Center and Airport Stations will be every 10 minutes. All trains will run to the Airport. All Blue/Green Line trains will run on a normal 20-minute weekend schedule. Rail service between Ashby and King Memorial Stations will be every 10 minutes. TIP: For Real-Time Rail and a link to rail schedules on the weekend, download the free ‘MARTA on the Go’ app for iPhone and Android. Must be at least 18 years old to participate. MARTA employees, or employee’s families, may not participate in the Hunt. 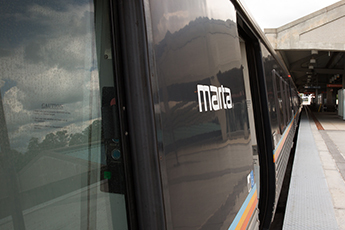 Are required to use MARTA rail, therefore, each team member will need to purchase or have MARTA fare with unlimited rides for that day. Passes may not be shared! A One Day Unlimited Ride pass is $9.00. If you do not have a reloadable Breeze card, you will need to buy one for $2.00 in a Breeze vending machine. Or, you may purchase a One Day Breeze paper ticket for $1.00 plus $9.00 for the unlimited ride pass.